In the early 90s, Ryan Hamit had a “bad spell” and ended up in a hospital struggling with a personality disorder. He bounced from various social service agencies and hospitals, encountering counselors that talked down to him and seemed to make problems worse. 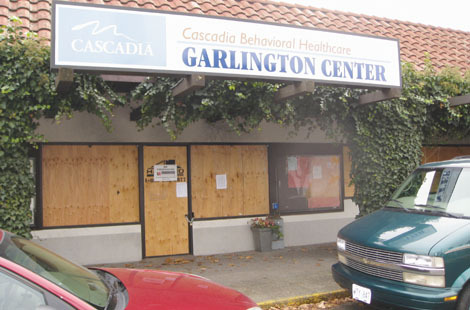 Things got better when he started using the Garlington Center, a longtime local mental health provider with multicultural roots, currently operated by Cascadia Behavioral Healthcare. At Garlington, he found himself better respected by the staff and not talked to as if he was a confused child, like he had at other places. Hamit started to improve. “I wouldn’t be near as well off if it wasn’t for the Garlington Center,” said Hamit. But over the past year, Garlington has had its own bad spell. It almost collapsed financially when Cascadia fell into financial turmoil. Then the center had a devastating fire. Named after the late Rev. John Garlington, an African-American minister who worked closely with the poor, the Garlington Center is one of the most culturally sensitive providers of mental health and substance abuse services in the area. It also connects people with stable housing and jobs. “These are the folks, where if they don’t have these services, they’re going to be downtown costing the community a lot more money,” said Jim Hlava, Cascadia’s vice president of housing. Essie Mae Morphis, an African-American client of the center for about 10 years, explained how Garlington has provided her with care that has no parallel in its cultural tactfulness. “If I couldn’t get my meds I’d be somewhere in a state hospital,” said Morphis of the value she places on Garlington services. Cascadia’s chief executive officer Derald Walker explained that the center helps people through group therapy, helping them develop a sense of stability, and assisting them in managing their own medication regimen. Statewide, Cascadia has an operating budget of about $42 million, which comes from a patchwork of state, county, and federal funds, according to Walker. It services about 525 people, he added. Last summer, the non-profit nearly collapsed financially due to mismanagement. According to reports on Multnomah County’s website, Cascadia was hemorrhaging money due to a faulty billing system (among other problems) that essentially didn’t charge the appropriate sources for services. In April of this year, Cascadia informed the county that it was on the verge of defaulting on a $2 million line of credit from Capitol Pacific Bank, and was about to go under. The Garlington Center would have expired had it not been for a loud chorus of voices that rose in protest. Gascadia was saved by a $2.5 million loan comprised of state and county funds. A nationally recognized consulting fire was called in to correct the problems with billing, among others. According to Walker, Cascadia has implemented many of the firm’s suggestions and is steadily recovering. “We’re cautiously optimistic,” said David Austin, spokesman for the county’s department of human services, which has worked closely with the Cascadia on its financials. He added that the mental health provider continues to provide an essential service to Portland. Austin said that Cascadia is taking recommendations from the county and the consulting firm seriously, and appears to be stabilizing. He also pointed out that Cascadia has passed along two of its other clinics to other non-profits, which has been a huge financial relief. The fire sparked last October in the Garlington Center’s Martin Luther King Jr. Boulevard location extensively damaged the building, a former NIKE factory outlet. Currently, the center looks as if it’s the aftermath of a war. Its windows are boarded up. Yellow tape lines scorched walls and corridors. The sharp, sour smell of the smoke has marinated the air, and still lingers heavily. The floor of some rooms is pitch black and sprinkled with broken glass. Since the fire, clients have had to go out of her way to an alternate Cascadia center on Southeast Division Street and 43rd Avenue. “It’s a hassle,” said Morphis of having to make the trek to the alternate center. The clinic’s director Tasha Wheatt-Delancy expects to have the MLK facility back up in about six months. Currently there are several trailers outside the building where clients will be served. They are not quite ready, said Wheatt-Delancy. But she’s hoping they’ll be ready soon. Hlava isn’t sure how much the building repairs will cost. The fire is considered “suspicious,” and is under investigation by local and federal investigators. Walker said that Cascadia is taking great care not to allow the tumult facing the organization to interrupt services facing clients. However, Cascadia’s problems aren’t entirely in the past. Walker said that the state budget cuts could affect the non-profit’s addiction treatment program, but isn’t entirely sure what could happen. “Making sure we have stable funding is our biggest challenge,” said Walker.